In many industries, it is a good idea to have a professional headshot so that you can portray a good image to the people that you will be connecting with. A good headshot might be the difference to help you land a job or an acting/modeling gig, and you need to make sure that your headshot sends the right message. The most important clothing item is the shirt or blouse that you are wearing, because it will be easily seen in the photo. You should consider bringing multiple shirts to choose from, and as your photographer, I can help you to select the right style and color for your photos. Depending on the session you choose, you will have an opportunity to change your clothes throughout the shoot so that you have several styles to choose from in your photos. Choosing your outfit for your headshot photography session can make a big impact on the way the photos turn out, and you want to make sure to select clothing that will be comfortable and attractive at the same time. The goal with the headshot is to make you appear confident, and emphasize your face and your eyes instead of the clothing. People connect first with your eyes in a photo. Sometimes, people get too caught up by choosing cute and trendy clothing, and it causes the picture to look unprofessional or amateur because of the clothing choices. Making poor clothing choices can detract from your face, and have a negative impact on the effectiveness of your headshot photo. It is a good idea to read through these guidelines before you choose your clothing for the photo shoot. You may bring several outfits if you want me to help select the best outfit for your session. To start with, make sure that your clothes are clean. Try your outfits on and give them the once over before the shoot. Wearing overly bulky sweaters or clothing, can look rumpled and make you look heavier than you are in reality. Wrinkled shirts, missing buttons, crinkled collars, dangling bra straps and even minor makeup stains show up on camera. Be your own best assistant. It is better to choose classic clothes instead of a modern trend, because the classic styles won’t date your photo and are usually more appropriate for most professions. 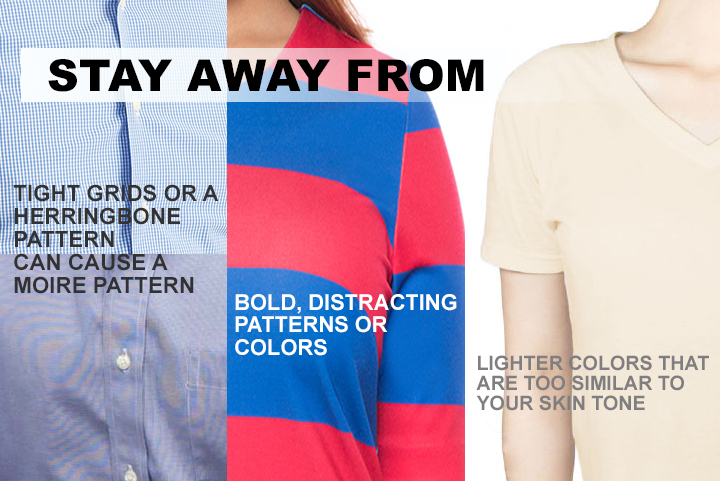 Try to stay away from anything with bold, distracting patterns or colors. Clothing with really tight grids or a small herringbone pattern can create a moiré pattern effect on your photo, so stay away from tight grid-like patterns. Thin stripes that are a little further apart are okay. Ties look best when their tone lands between the suit and the shirt-- so a light shirt, a dark suit, and a tie in a shade somewhere between them. Some ties are too shiny-- try to stay away from really reflective, shiny, silk ties. If you don't wear a tie, choose a non-white shirt if possible. White shirts without a jacket and tie to break them up can lose detail in the color and folds. And if you wear a button-down shirt, it's best to wear a jacket or sweater of some kind to layer the look. If not, choose a darker color shirt or something with pockets or details to avoid it looking like a head floating on a blank, boxy shirt, and unbutton a button or two. 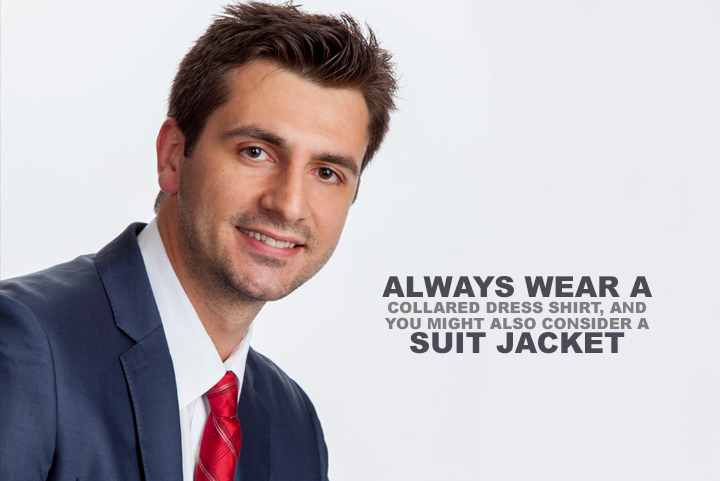 And make sure we can't see your undershirt beneath the button-down shirt, wear a v-neck or no undershirt at all. In terms of color, it is important to stay away from patterns, because the patterns can detract from your face. These patterns will make the photo too “busy” and they can be very distracting. Stick with darker colors instead of lighter colors, because the darker or mid-tone colors tend to put more emphasis on your eyes and smile, instead of the clothing. 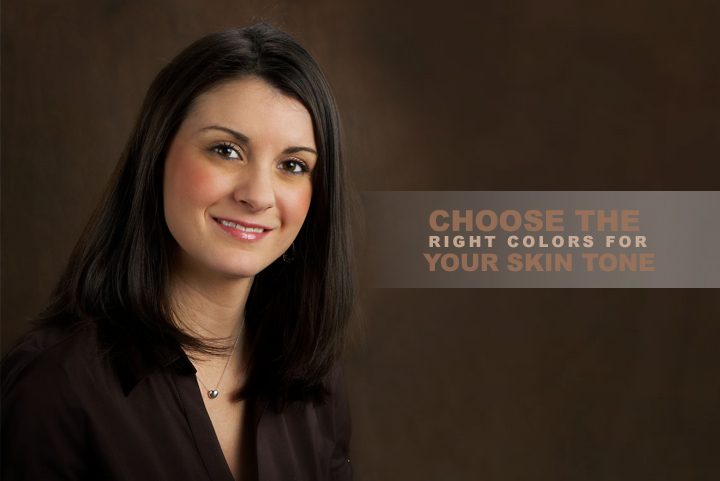 Always avoid lighter colors that are too similar to your skin tone, because they can make you appear washed out. It is best to wear colors that are contrasting to your skin, so if you have medium or darker colored skin tones, then you should avoid the earthy colors that are very similar to the color of your skin. You may consider selecting a color that can help to bring out the colors in your eyes. For example, if you have blue eyes, then you may consider a blue or grey shirt. Or, if you have brown or green eyes, then earthy tones can be very complimentary to your eye color. You should consider the industry that you are working in to help you make your clothing selections. 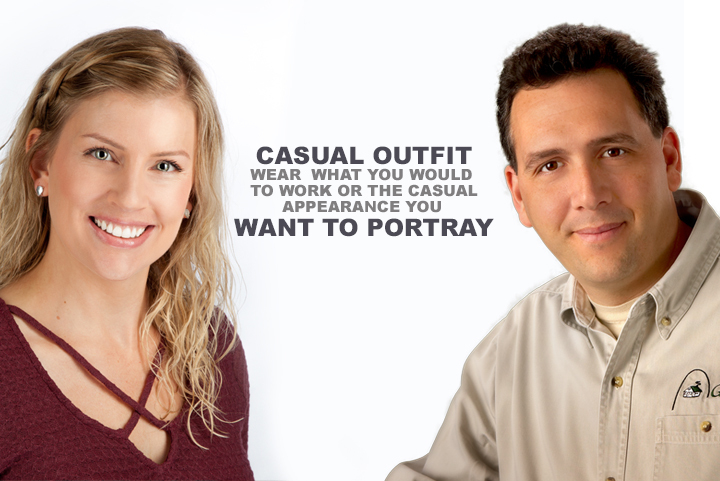 Keep in mind that a corporate headshot should have a different feel and appearance than a service industry headshot, and you need to make your clothing choices accordingly. It is a good idea to look through headshots of other people in your industry, in order to get a feel for the types of clothing that they wear in their photos. For example, you might look at the company website to see the clothing choices of some of the leaders and managers in your company, and choose your clothing to match that same style. Here are some guidelines for specific industries, as well as tips for both men and women in each industry. If you are working in a corporate environment, then it is important that you are wearing the right type of clothing that is common in an office. Many corporations have conservative dress codes, and you want to be sure that the clothing in your picture is the type of clothing that you could wear when you are going to work each day. As a general tip for both men and women, it is best to wear long sleeves in a corporate headshot, because the bare arms are often distracting. Many people consider bare arms to be inappropriate in a corporate headshot. For women: For women: Choose a professional suit or business-oriented outfit that has a classic look. Don’t choose anything with bold, distracting patterns or colors, unless you can layer a plain blazer or sweater over it so not much of the pattern is showing and you get just a pop of color. Try not to wear stark white unless it’s under something, such as a suit jacket, cardigan, or sweater. V-necks accentuate the neckline and generally look best on women. Just don’t choose something with too low of a neckline. No turtlenecks, they tend to make people look like they have no neck at all in photos. For jewelry, go for something small, classic, and not very reflective or flashy. Earrings shouldn’t dangle more than an inch from your earlobe. Simpler is always better, you don’t want to notice your jewelry before you notice your face. For men: Always wear a collared dress shirt. A suit jacket can give you a classic look. If you want to add individual style to the photo, then you may consider options such as V-neck sweaters over your dress shirt, or a tie that makes a statement. If you wear a tie without a jacket or sweater, choose a non-white shirt if possible. Choose a darker color shirt to avoid it looking like a head floating on a blank, boxy shirt. If you don’t wear tie unbutton a button or two. And make sure we can't see your undershirt beneath the button-down shirt: wear a V-neck or no undershirt at all. When you are choosing a casual outfit, a good guideline to follow is to consider the type of outfit that you would wear to work or the casual appearance you want to portray. Some are tempted to make a statement with their clothing in their headshot. Your goal is to show your face in the headshot, and if someone comments about your clothing then it means that you have failed with your clothing selection. You want to sell yourself, not the clothing that you are wearing! Select a nice outfit that falls within the general guidelines that were discussed at the beginning of this article. For women: It is always a good idea to avoid low cut tops, because they make it difficult to crop close. Also, make sure that your shirt or blouse has long sleeves, because tank tops and short-sleeved shirts can be distracting. Generally, you want to keep your shoulders and arms covered in headshot photos. For men: Good clothing styles to consider are solid colored shirts or sweaters that have some type of a texture, such as ribbing or chain stitching. Long sleeves are usually best, and you might consider wearing a collar if it matches your personality. Or, you can choose another style of shirt if you don’t want to wear a collar. It is a good idea to stay away from crew neck shirts, because it is difficult to make those shirts look good in a headshot photo, consider a V-neck. There are many opinions about the types of clothing that you should wear for a headshot photo session, we are here to help you before making your decision. Sharing details about the purpose of the session can help us to create the right types of photos, and we can advise you on the clothing choices that you should bring with you. 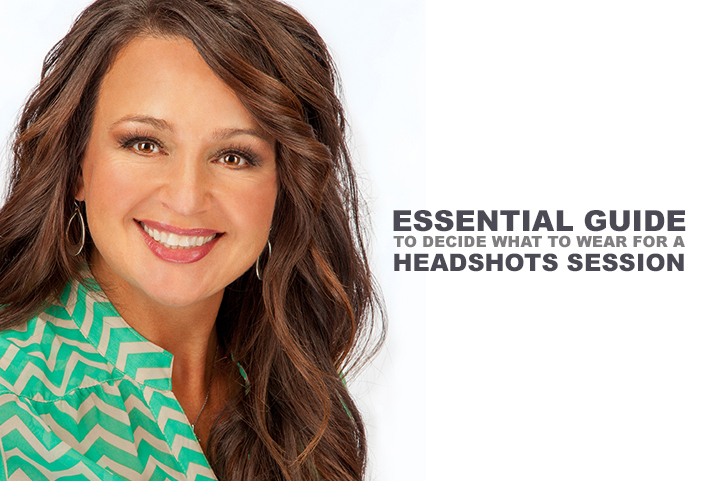 Keep in mind that you may encounter specific situations where you may want to “break” one of the rules for headshots. You may find situations where a funky style headshot can be more beneficial than a basic headshot, so it is nice to have several options available to choose from. In most situations, these guidelines should be followed, but there are occasional situations where it might make sense to change some of your clothing choices. Having a good headshot is an important tool to help you, brand your business, advance your career and land the jobs that you want. It’s exciting that so many opportunities exist to express a professional and personal brand. Are you ready to refresh your Business portrait image? Give me a call and schedule your professional headshot photoshoot, it’s an enjoyable experience.